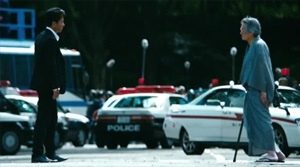 Review: When it comes to director Takashi Miike you can never be sure what to get. It could be a "13 Assassins" or a "Lesson of the Evil". The last few years the director more and more often tried his hand at bringing commercial movies to the big screen (and at times successfully so). "Shield of Straw" is supposed to be a Hollywood thriller, there is no doubt about it, but Miike trips in respect to the pacing of his movie. Moreover, there is only little suspense and the characters remain rather shallow. Despite all that the thriller constantly gives the impression that it actually would have been possible to deliver a pretty appealing film with this story. In the end "Shield of Straw" is occasionally entertaining, but just not all the way through. The story of the film is based on a novel by Kazuhiro Kiuchi, and yes, there are a few plot holes. But to argue that the whole story is absolutely beyond belief as it could have been prevented in the very beginning for the bounty to be taken serious is nonsense. Ninagawa is so rich that he could easily find a way to get the bounty to Kiyomaru's killer or his family, even if authorities wanted to avert it. You just have to look at our reality and what politicians and bank managers are pulling off without having to fear any consequences. To arrest Ninagawa also wouldn't be a real option, but not even that is possible since no one can find him. Therefore, the story is pretty perfidious in its core and not that unbelievable in turning a whole country into potential killers. That's the material you can carve a suspenseful thriller out of. But unfortunately this is seldom the case. With its 125 minutes running time "Shield of Straw" drags on unnecessarily. 90 minutes would have been a lot better and some of the lengthy but not really necessary dialogue easily could have been cut out. There aren't that much action scenes either, aside from a pretty impressive assassination attempt on the killer when he is transfered by a big police convoy and maybe also apart from a small shootout at an express train. The main focus lies on finding out who is leaking information about Kiyomaru's whereabouts to the public. The search for the mole turns out to be not nearly as thrilling as it could have been, we even don't really care about it. Maybe that's because we wouldn't have any objection at all should Kiyomaru be killed. That is because Kiyomaru is a sick monster. There is not even the slightest of doubts about it and it is constantly underlined very clearly as well. Thus, you can't even sympathize with him for one second. Tatsuya Fujiwara ("Death Note", "Kaiji - The Ultimate Gambler") is a master of overacting and even though that might not necessarily be a bad thing it seems rather unrefined for a role like this one. Takao Osawa ("Goemon", "Aragami") manages to give his role a bit more color, but when it comes to him the same problem becomes apparent as with every other character in the movie: They are written too shallow. Accordingly, the difficult ethical decisions they have to make don't touch us at all. It is a fascinating plot. To kill Kiyomaru maybe wouldn't be the worst of decisions, but this act shouldn't be commited by an individual, otherwise the existing state of law would soon crumble. The most important thing is to keep law and order (and not to protect the pride of a nation as is stressed over and over again). The more victims there are the more it becomes necessary to protect Kiyomaru in order for those victims not to have died in vain. An appealing story because if there weren't a bounty and the killer would be executed in an act of revenge the movie would have a completely different color to it and weren't so sophisticated. But even though the ending is quite alright, Miike can't convey the complex ethical questions that inevitably have to be raised in the film. Furthermore, the story has a few plot holes and there simply is a lack of suspense and character elaboration. "Shield of Straw" isn't a bad movie, but sadly it also isn't an extremely good one either. Yet, it could have had what it takes to be one.